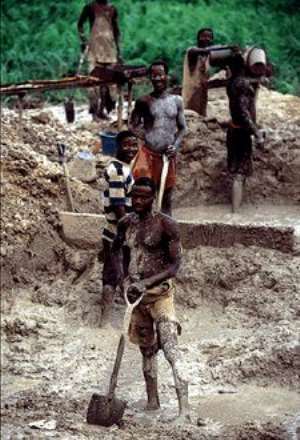 Five illegal miners popularly known as galamsey operators have died after a pit they were working in caved in on them. The accident occurred near Prestea in the Western region. But reports that the death of the five may not be big news in the area. There were six galamsey operators inside the pit before it collapsed all but one survived. It took many hours before the dead were removed from what would have been their permanent grave. The deceased have been taken to the Prestea mortuary. For many people in the Prestea area where the illegal gold miners died, it is not exactly a big deal; it is known that deaths of galamsey operators inside collapsed pits are regular and sometimes go unreported. There are even tales that colleagues of some of the dead god miners hardly loose the moment concentration to mourn. The traditional decent burial for dead is often denied them as well; often too the political as well as traditional authorities fail to make any statements when the tragedy occurs. In the gold mining areas of the Western Region it is business as usual whether a galamsey operator die or live, the only that really matter id Gold.